In an extensive interview with Scott Pelley on CBS' "60 Minutes" this past Sunday evening, U.S. Secretary of State John Kerry revealed a startling lack of awareness of certain basic facts regarding Iran's nuclear program and the history of various proposals Iran has made to alleviate suspicion over its intentions. Such ignorance goes a long way to explaining how faulty and false information is disseminated by politicians, goes unchallenged by the press and is subsequently regurgitated by professional pundits who take government declarations at face value without engaging in either critical thinking or independent verification. 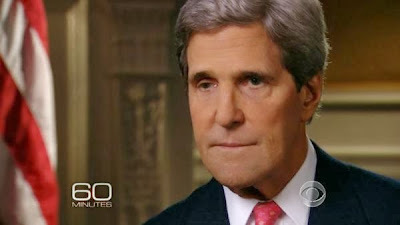 Interviews such as Kerry's on "60 Minutes" effectively launder lies by turning false information into uncontested fact, simply by virtue of their repetition by someone believed to be both knowledgeable and reputable. John Kerry: Iran needs to take rapid steps, clear and convincing steps, to live up to the international community's requirements regarding nuclear programs, peaceful nuclear programs. Scott Pelley: Give me an example, one concrete step, one thing that they can do to assure the world that they're giving up their ambitions. John Kerry: They could immediately open up inspection of the Fordow facility, a secret facility and underground in the mountains. They could immediately sign the protocols, the additional protocols of the international community regarding inspections. They could offer to cease voluntarily to take enrichment above a certain level, because there's no need to have it at a higher level for a peaceful program. Scott Pelley: Enrichment of uranium, which is what happens at Fordow. Scott Pelley: Throw the doors open to that place. John Kerry: Well, that, among other things. Look, I believe, that we have hopes. President Obama clearly welcomes President Rouhani's overtures. But words are not going to replace actions. What we need are actions that prove that we and our allies, our friends in the region, can never be threatened by this program. Scott Pelley: But the United States would look favorably on relaxing or eliminating the sanctions if the Iranians were serious about abandoning their nuclear weapon. First, the International Atomic Energy Agency (IAEA), which monitors and safeguards "international community's requirements regarding nuclear programs" has never once found Iran to be in violation of its obligations under the Nuclear Non-Proliferation Treaty and has consistently affirmed that Iran's nuclear program remains peaceful, as no nuclear material has ever been diverted to a military program. Regardless of what questions may remain about Iran's past research or hypothetical ambitions, the IAEA has repeatedly noted "that the Agency has not detected the actual use of nuclear material in connection with the alleged studies." Pelley's weird comment about "the Iranians...abandoning their nuclear weapon," literally makes no sense considering that the United States intelligence community and its allies have long assessed that Iran is not and never has been in possession of nuclear weapons, is not building nuclear weapons, and its leadership has not made any decision to build nuclear weapons. Beyond this, though, the "one concrete step" Kerry suggests to Pelley that Iran might do to signal its transparency and good intentions is something Iran is already doing. Kerry states that Iran "could immediately open up inspection of the Fordow facility, a secret facility and underground in the mountains," yet the enrichment facility at Fordow is already open to intrusive IAEA inspections and has been since being declared to the agency by Iran itself in September 2009. The site was announced by Iran to the IAEA on September 21, 2009, well in advance of the 180 days before becoming operational as required by Iran's Safeguards Agreement. At the time, the facility was still under construction and did not actually begin uranium enrichment until early January 2012, roughly 840 days after it had been declared to the IAEA. The facility was subsequently described as "a hole in a mountain" and "nothing to be worried about" by then-IAEA Secretary General Mohammed ElBaradei. When the plant began operation, IAEA spokesman Gill Tudor confirmed to the press that "all nuclear material in the facility remains under the agency's containment and surveillance." To date, this continues to be true. Furthermore, Iran has never refused IAEA inspectors admission to any of its safeguarded nuclear sites. All sites and facilities are under video surveillance, readily accessible to IAEA inspectors, open to routine inspection, and subject to material seals application by the agency. In addition to the two regular inspections all of Iran's enrichment facilities are subject to each and every month, "two unannounced inspections are conducted every month at Fordow," according to the London-based International Institute for Strategic Studies (IISS). So, when Pelley suggests - and Kerry concurs - that Iran should "throw the doors open" to Fordow as a sign of good faith and legal obligation, they reveal their staggering ignorance of the facts on the ground. Nuclear expert Mark Hibbs has explained on the Arms Control Wonk blog,"There are IAEA safeguards personnel in Iran 24/7/365," pointing out that inspectors enter and examine enrichment sites like Fordow "frequently and routinely," where they carry out "two kinds of inspections: 'announced inspections' and 'short-notice announced inspections.'" The "announced inspections" are conducted with "24-hour notification" given to Iran, while "Iran's subsidiary arrangements in fact permit the IAEA to conduct a short-notice inspection upon two hours' notice." Former Iranian nuclear negotiator Seyed Hossein Mousavian, now a lecturer at Princeton University, has noted, "Since 2003, the International Atomic Energy Agency (IAEA) has implemented the most robust inspections in its history with more than 100 unannounced and over 4000 man-day inspections in Iran." And in 2012 alone, IAEA investigators spent 1,356 calendar days in Iran, conducting 215 on-site inspections of the country's 16 declared nuclear facilities, and spending more than 12% of the agency's entire $127.8 million budget on intrusively monitoring the Iranian program, which fields only a single functional nuclear reactor that doesn't even operate at full capacity. Again, no diversion of nuclear material to a military program has ever - ever - been found. Kerry also suggests Iran should "sign...the additional protocols of the international community regarding inspections." What he either doesn't say or doesn't know is that Iran has already signed the IAEA's Additional Protocol; the Majlis (Iranian Parliament), however, has never ratified it. Nevertheless, for over two years beginning in October 2003, Iran voluntarily abided by the protocol, which allowed IAEA inspectors access to facilities usually not covered by its standard Safeguards Agreement. In November 2003, the IAEA affirmed that "to date, there is no evidence that the previously undeclared nuclear material and activities referred to above were related to a nuclear weapons programme." And the following year, after extensive inspections of Iran's nuclear facilities were conducted under the auspices of the Additional Protocol, the IAEA again concluded that "all the declared nuclear material in Iran has been accounted for, and therefore such material is not diverted to prohibited activities." This conclusion has since been reached by every single IAEA report - often upwards of four times per year. After it became clear to Iran that, at the insistence of the United States, its inalienable right to domestically enrich uranium would not be recognized, it stopped voluntarily complying with the Additional Protocol, but has maintained its obligations under its Safeguards Agreement. Secretary Kerry, as seen above, also stated that Iran "could offer to cease voluntarily to take enrichment above a certain level, because there's no need to have it at a higher level for a peaceful program." Ok, for one, Iran is enriching uranium far below weapons-grade levels, for the purposes of fueling nuclear power plants and to use in medical research reactors. The only reason Iran began enriching uranium to almost 20% is due to the refusal of the United States to allow Iran to purchase such nuclear material for its safeguarded Tehran Research Reactor on the international market. More importantly, however, is the fact that Iran has for years offered specifically to restrict its enrichment program and to open it up to international cooperation, thereby making it literally impossible for diversion to weaponization to take place unnoticed. Two decades ago, Iran was making such gestures, only to be rebuffed, denied and dismissed by the United States. In October 1992, in response to American concern over assessments that Iran was pursuing a "research programme for fissile material production" (i.e. a domestic enrichment program), Iran not only "repeatedly denied any non-peaceful intentions, stating that it accepts full-scope IAEA safeguards, is a signatory to the NPT and requires the nuclear plants for electricity generation and desalinisation," but also "indicated it is prepared to accept enhanced safeguards measures on both nuclear cooperation agreements with Russia and China, as well as having no objections to the return of the spent fuel to the country of origin as a similar agreement had been concluded with Germany during the 1970s." In mid-2003, Hassan Rouhani, then Secretary-General of Iran's Supreme National Security Council, said that, in order to resolve any questions over whether its nuclear program is for peaceful purposes only, Iran was "ready to accept the participation of other big industrialized countries in its [uranium] enrichment projects." Later that year, Iran declared, even though it had the "right within the nuclear non-proliferation regime to develop nuclear energy for peaceful purposes," the country's leadership had "decided voluntarily to suspend all uranium enrichment and reprocessing activities," in order to best resolve all outstanding issues with the IAEA. On March 23, 2005, the Iranians presented a four-phase plan to their European negotiating partners, which offered to restrictions and enhanced monitoring, along with prescribed, reciprocal actions by the EU, and was intended to end the nuclear impasse once and for all. It called for Iran to resume uranium enrichment, with EU cooperation, and for the Majlis to begin the process of approving legislation that would permanently ban the "production, stockpiling, and use of nuclear weapons." The critical second phase of the plan would establish a "ceiling of enrichment at LEU level" and set a "limitation of the extent of the program." In his first address before the UN General Assembly in September 2005, then Iranian President Mahmoud Ahmadinejad said that, as a "confidence building measure and in order to provide the greatest degree of transparency, the Islamic Republic of Iran is prepared to engage in serious partnership with private and public sectors of other countries in the implementation of uranium enrichment program in Iran. This represents the most far reaching step, outside all requirements of the NPT, being proposed by Iran as a further confidence building measure." On November 18, 2005, in yet another publicly presented proposal, the Iranians repeated the offer set forth earlier that year, reiterating its willingness to cap its level of enrichment, set a "[l]imitation of the extent of the enrichment program to solely meet the contingency fuel requirements of Iran's power reactors," and agreeing to the "[i]mmediate conversion of all enriched Uranium to fuel rods to preclude even the technical possibility of further enrichment." Iran also included the ongoing "implementation of the Additional Protocol," instituting a [p]ermanent ban on the development, stockpiling and use of nuclear weapons through binding national legislation," and allowing enhanced and [c]ontinuous on-site presence of IAEA inspectors at the conversion and enrichment facilities to provide unprecedented added guarantees." This was all while Iran was in the early stages of enriching uranium and had hardly any stockpile. That was seven-and-a-half years ago. The United States, and its European lackeys, either ignored or rejected these proposals. Rouhani is now the President of Iran and Zarif is his Foreign Minister. Since then, we are to believe that sanctions, which harm the health, lives and livelihood of ordinary (and often the most vulnerable) Iranians, and the constant threats of military action have forced Iran to the negotiating table, ready to capitulate to Western demands. But Iran has been offering the same things for a decade. All it has asked in return is acknowledgement of its national rights. This had not changed. In March of this year, Iranian leader Ali Khamenei was clear. "In the nuclear issue, Iran only wants the world to recognize its right to enrichment, which is Iran's natural right," he said during a speech in the northeastern Iranian city of Mashhad. "If the Americans truly want to resolve the nuclear issue with Iran, the solution is easy," he declared, "They should acknowledge Iran's right to enrich uranium for peaceful purposes." Similarly, President Rouhani recently insisted, "We will never forgo our…intrinsic right to a peaceful nuclear program, including uranium enrichment," adding that "no amount of pressure, arm-twisting, threats and sanctions will cause Iran to abandon this right." John Kerry, of all people, is well aware of Iran's right to enrich uranium. In a 2009 interview with the Financial Times, Kerry himself stated that the demand - once pushed by the Bush administration and now maintained by Israeli Prime Minister Benjamin Netanyahu - that Iran have no enrichment capability is "ridiculous" and "unreasonable." As a new round of nuclear talks between Iran and the the five permanent, nuclear-armed members of the UN Security Council and Germany looms on the horizon, and communication between Iran and the United States has been restored at the highest levels, hopefully Secretary Kerry will do a little more homework about the Iranian nuclear program. Getting the facts straight can only increase the possibility of a real diplomatic breakthrough and potentially put an end, once and for all, to this absurd charade.